A luxury at home facial treatment and intense skin booster. Wakame maximises cellular energy and vibrancy, stimulates collagen formation for skin firmness and flexibility. Everlasting Flower rich in flavonoids (Quercetin, Kaempherol) instantly reduces oxidative stress and soothes skin inflammation. The unsaponifiable fraction of Avocado oil is bursting with vitamins A, C, D and E. Uniquely it both nourishes and softens the skin`s top layer plus penetrating deeper layers too, restoring moisture balance and maintaining elasticity. Green Marine macro algae ensures intense hydration to deeper skin tissues. Tara Bush, rich in polysaccharides, plumps skin reducing the appearance of wrinkles. Ylang Ylang is a natural mood lifter and relaxer to reduce stress and anxiety whilst balancing the skin, correcting both dry or oily skin types. Green Tea protects against collagen breakdown preserving integrity of the skin structure. Mandarin oil has an uplifting effect on the mind and adds moisture to the skin, promotes the growth of new skin cells and refines skin texture. Hemp Seed, Perilla, Evening Primrose, Avocado & Shea Butter create a balanced nutrient-rich fatty acid skin complex creating a beautiful skin feel. Aqua, Elaeis Guineensis Oil*^, Cetearyl Alcohol, Helianthus Annuus Seed Oil*, Cannabis Sativa Seed Oil*, Butyrospermum Parkii Butter*^, Cetearyl Glucoside, Simmondsia Chinensis Seed Oil*, Perilla Frutescens Seed Oil*, Oenothera Biennis Seed Oil*, Olea Europaea Fruit Oil*, Glyceryl Stearate, Squalane, Hydrolysed Caesalpinia Spinosa Gum, Enteromorpha Compressa Extract, Glycerin, Rosmarinus Officinalis Leaf Extract*, Helichrysum Stoechas Extract*, Aloe Barbadensis Leaf Juice Powder*, Undaria Pinnatifida Cell Culture Extract, Sodium Stearoyl Glutamate, Aroma [Lavandula Angustifolia Herb Oil*^, Cananga Odorata Flower Oil*^, Citrus Nobilis Peel Oil*, Zingiber Officinalis Root Oil*, Citrus Limon Peel Oil*, Cinnamomum Camphora Bark Oil], Camellia Sinensis Leaf Extract*, Persea Gratissima Oil Unsaponifiables, Benzyl Alcohol, Sorbic Acid, Salicylic Acid, Limonene*, Linalool*, Geraniol*, Citral*. Apply to perfectly cleansed and exfoliated face and neck. Leave for 20-30 minutes before removing excess with a soft tissue. 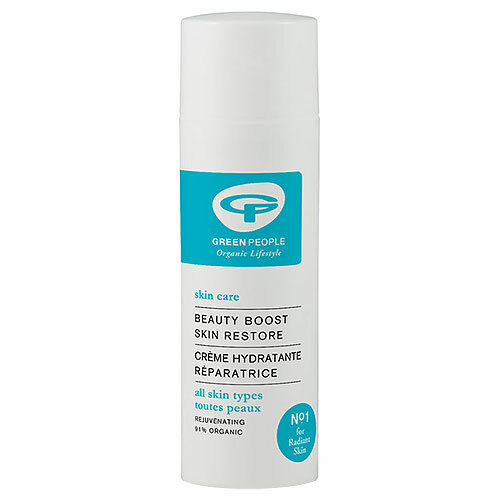 Below are reviews of Green People Beauty Boost Skin Restore - 50ml by bodykind customers. If you have tried this product we'd love to hear what you think so please leave a review.